To Roberts Cove and Beyond !!! There is something about swimming in the open water from A to B that is very appealing. Some say I must be crazy to swim in the cold open water when I could be in a heated pool. Well open water swimmers think it is crazy to swim up and down in a pool hitting the same wall over and over and over. I did a lot of training over the winter in the pool and in the sea just so that I could do these longer distances. I thought for a long time that 2km was my limit and I could not imagine going any further. 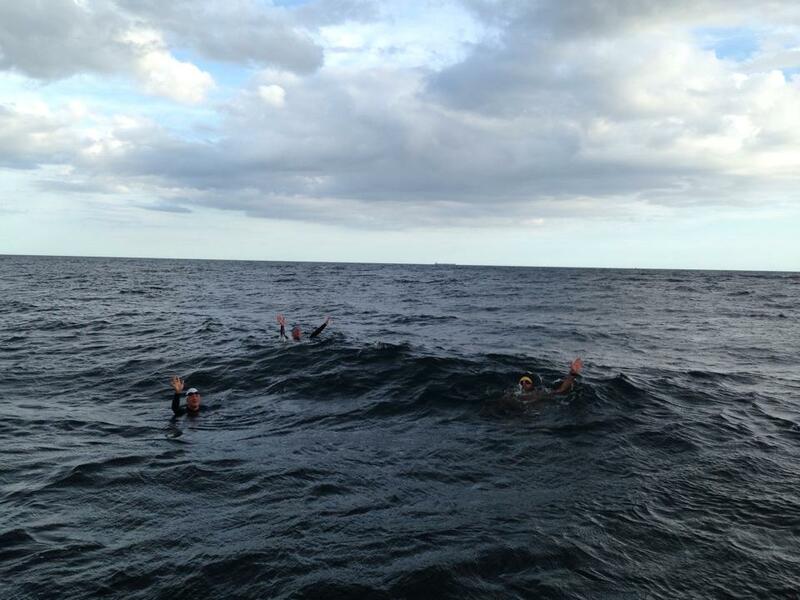 However we all need to challenge ourselves and with that in mind and without discussing it with the other swimmers we all seemed somehow to start pushing the distance. The Dutchman became too short and happiness could only be found by adding distance. Myrtleville to Fountainstown and back started to become the norm at 4km and sometimes we threw in a trip to the Dutchman to get the distance up to 5km. It only seemed natural then to look to go further in one direction!!! Facebook and a glass of red wine have a habit of making me post swims that would normally be kept safely in the back of my mind. So I finally opened a bottle and posted “Myrtleville to Roberts cove at 6km”. There, I said it……..
Ian Venner replied to the Facebook post and offered his services and the use of the SS Craggy Island. So that was that, no going back now. We set the date for Saturday 23rd Aug.
1630 sharp and Breda Maguire and I are waiting on the beach for Craggy Island to arrive with Sean Foley, Amy Barry Murphy, Ger Venner and Harry Casey. While we wait we can’t help but notice the white horses dancing off the coast. It’s a bit choppy out there I say to Bernard Lynch who replies “Its not ideal, but you will be fine” before adding that he only saw one Lion’s Mane jellyfish out there! The Craggy Island four soon arrive and like navy seals they dive off the bow and swim to shore. After taking the obligatory photos we turn and swim straight out past Bunny’s. We round the corner after Bunny’s and there it is, the choppy open water and it is coming straight at us. Ian requested that we all regroup before crossing the large expanse of Ringabella bay as there are a lot of craft in the area. 42mins in and 1.73km (2) up on the clock and I’m still looking at Fountainstown on my right. The mind starts going to negative town. I’m thinking we will take more than 3hrs if the chop keeps slamming us like this. 56min 2.31km (3) and Ian approaches Breda, Harry and myself for our first feed as soon as Ger, Amy and Sean have cleared Ringabella bay. I remember the advice Carol Cashell gave me and lie on my back while I feed but only manage a few sips and more salt water as Craggy Island drifts down on us in the swell. Breda and Harry manage much better and have time for some Banana. We swim on and watch Ian head back to the others who seem to have spread out at this stage. 1hr 38min 3.94km (4) and we are a bit behind our planned time but it doesn’t matter as we are enjoying the swim in the swell and chop. Breda asks if we need to round the headland in the far off distance but thanks to my Garmin I’m able to inform her that we only have the Dutchman and back to do (1.5km) and that we are turning at the nearby headland. We swim on and as I lift my head for sightings I enjoy the sight of Harry and Breda disappearing behind every swell and wave even though they are only 10ft away. It feels perfectly natural in the large swell and I get into the zone and hum tunes (Irelands Call) as I exhale every breath to pass the time. 2hr 4.75km (5) and Ian joins us again for our second and final feed. This time I ask him to drop a rope so I can hold on while I feed (yes I cheated !). This time I take on board the full 250ml and a few jelly babies (another Carol Cashell trick). Breda and Harry also have a good feed and while we feed we hear shouting from the hills above. Claire, Peter, Nana and John (my family) are up there to give us boost and it works. We know the finish is in sight and the mind now seems very positive. We all are enjoying every stroke, breath and wave. 2hr 9min 5km (6). I shout over to Harry and Breda to have one final look back towards Myrtleville before we turn for Roberts Cove. It is some sight. It seems to be so far away. We turn and follow the shoreline passing fishermen (Sean Foley asked them if this was “Irlande” in a French accent) (7) on the rocks before seeing Roberts cove and listen to the cheering of our respective families encouraging us to the finish. 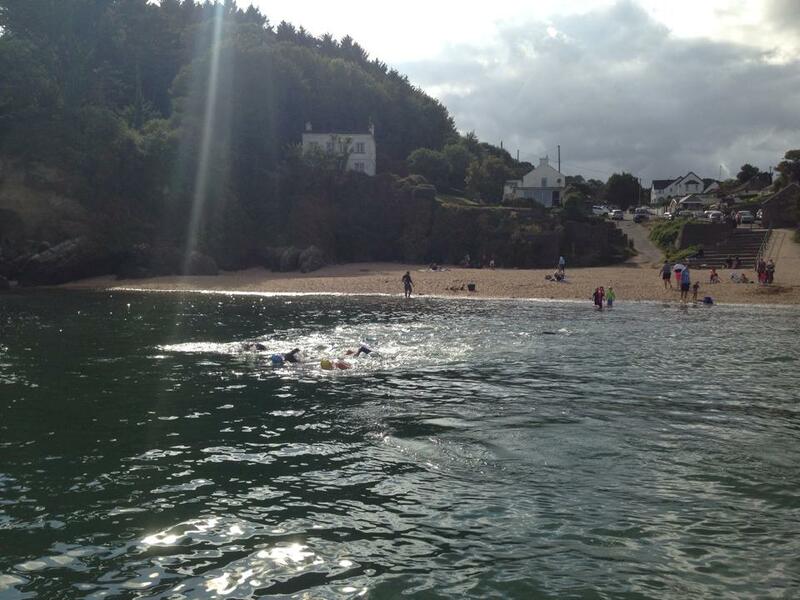 The last 500m of the swim are in clear sandy bottomed water all the way to the beach and the cheers of our families. We finish in a time of 2hr 38min for the 6km. Barbara Anne greets us with cups of soup and Kit-Kats – which I have to say are an excellent combination. Amy, Ger and Sean soon follow to the same warm reception. As swims go this was by far the most enjoyable and satisfying one of them all. We topped the night off by heading to Cronin’s pub for some food and drink and stories of a swimming nature. As with every swim, it is those who don’t swim make the swim happen. 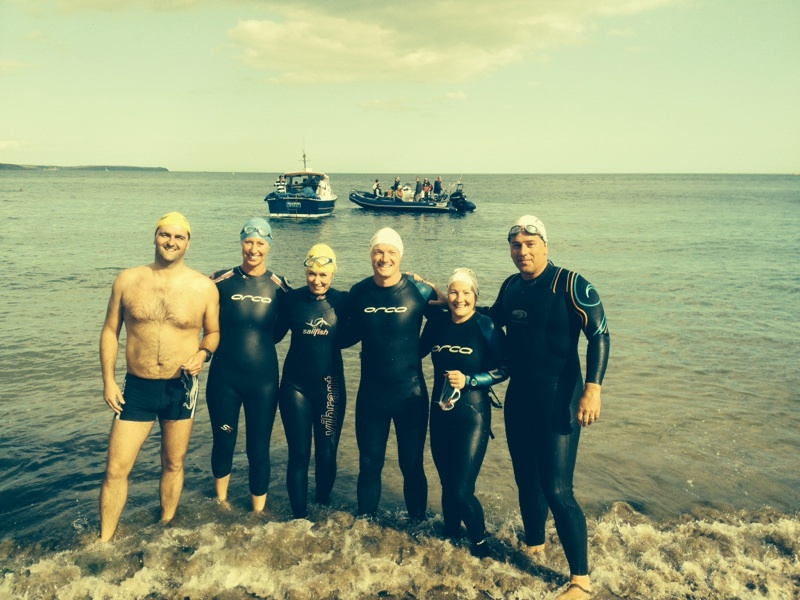 A big thanks to Ian Venner and Gillian Vaughan for providing cover for the swim on board Craggy Island. We could not have done it without them. Some additional thoughts from a support boat perspective … for anyone else contemplating it! We had planned to leave a little before HW (-30) so as to benefit from the W ebb, without being out there in the worst of it. Just as well we did, as despite W/NW forecasts there was quite a chop from the S. This was aggravated by the W’ly ebb, particularly at the headlands (Bunnys – Ringabella was the flattest stretch of open water!) 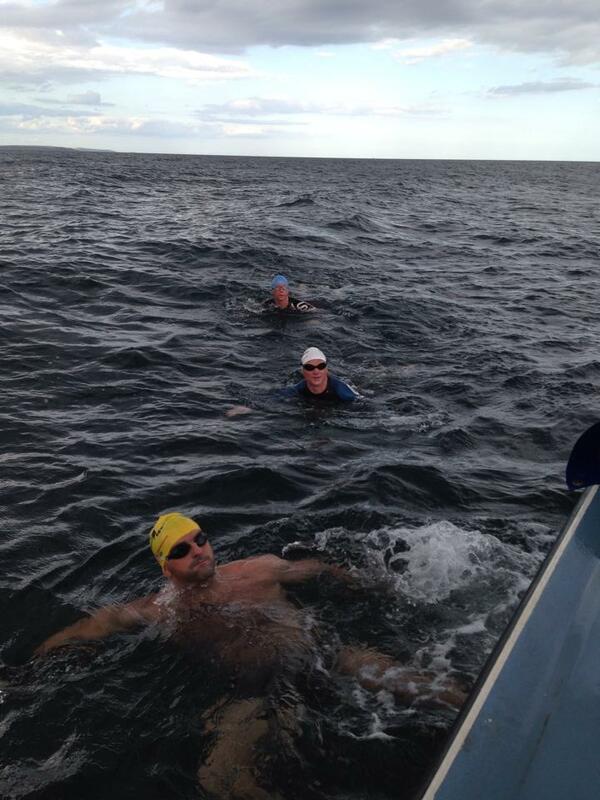 and especially because 5 of 6 swimmers decided to go sightseeing offshore – only Sean stayed closest inshore. He probably didn’t get as much W ebb under him, but equally didn’t get the battering others did in the 3-4′ chop (with occasional white horses). 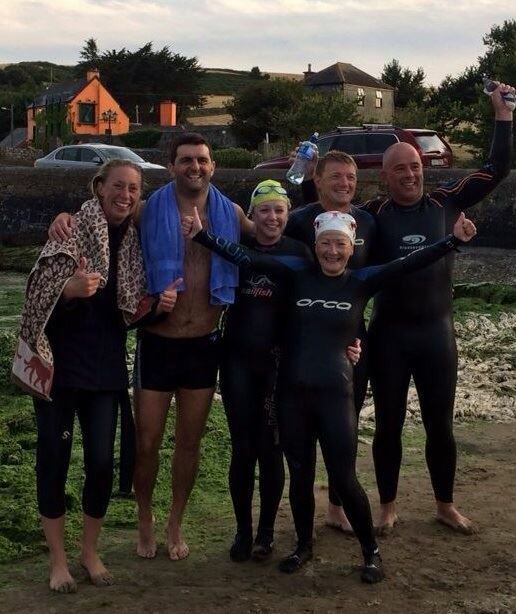 I suspect it would actually have paid to hug the coast even more from Fish Point to Cork Head and pay the distance penalty that way rather than taking the a) beating and b) added vertical swim distance caused by the waves – notwithstanding the tidal flow gains. Being a Saturday pm there was a bit of traffic around Ringabella/Fountainstown – thankfully we had a second rib for that part of the trip, especially given the group split into 2 bunches. Had the day been more pleasant, it would have been a bigger issue but also easier to see swimmers, etc. Easy really, bottles float, or if you are uber-fancy have a long bit of string attached. Bananas seemed to be easier than expected – as long as they were peeled first! Breeze meant that support boat was either blown down on, or away from, the swimmers – and engines were off for obvious reasons – so they either kept having to kick off or catch up. Conditions made swimmers hard to see at times, especially spread out (even though only a couple of hundred yards). The white Myrtleville hats, though lovely, are useless… Gary’s yellow was much better. We did bring Siobhan’s orange float with us, and didn’t use it – it undoubtedly would have aided visibility, but given the headwinds would also have caused a fair bit of drag.